Recent changes in regulations and accounting standards led our clients to focus on liability risks mitigation, as both stricter solvency requirements and the value of their discounted liabilities went from fixed to mark-to-market rates. Those latter changes resulted in higher liability portfolio volatility and in a greater focus on risk management, as mitigating the volatility of our clients’ funding ratio became necessary. The effects of those new constraints were further compounded by stricter solvency requirements. Cash-flow matching techniques involve ensuring a perfect static match between the cash flows from the portfolio of assets and the commitments in the liabilities. The aim is therefore to construct a portfolio of assets whose future cash flows will be identical to the structure of the plan’s commitments. The client’s liability structure can be defined simply as a series of cash outflows to be paid, the real value of which is known today, but for which the nominal value is typically matched with an inflation index. Knowing the structure of the client’s liabilities, it is then possible to construct a portfolio of assets whose future cash flows will be identical to this structure of commitments. To do so involves purchasing inflation-linked zero-coupon bonds with a maturity corresponding to the dates on which the monthly pension installments are paid out, with amounts that are proportional to the amount of real commitments. However this technique, which provides the advantage of simplicity and allows, in theory, for perfect risk management presents a number of limitations. Lack of inflation-linked securities whose maturity corresponds exactly to the liability commitments. Immunization techniques complement cash-flow matching by allowing residual interest rate risks created by imperfect matches between assets and liabilities to be managed in a dynamic way. QMS Advisors employs interest rate risk management techniques that can be extended beyond simple duration-based approaches by hedging non-parallel shifts of the yield curve and by adjusting for convexity. Cash-flow matching and immunization approaches imply asset allocations that might be disproportionately conservative and therefore not necessarily optimal, as a large opportunity cost owing to a lack of risk premia makes those approaches very costly, leading to unattractively high levels of contribution. Introducing asset classes and strategies that are not perfectly correlated with the liabilities into the strategic asset allocation allows investors to obtain a more attractive risk-adjusted excess return through an efficient exposure to rewarded risk factors. Liability Driven Investment techniques: QMS Advisors utilizes different techniques to optimize plans’ surplus risk. Stochastic models are favored as they allow for the representation of a plan’s uncertainty relating to a set of risk factors that affect the liabilities, such as financial risks (inflation, interest rate, stocks) or the risks attached to plans’ actuarial assumptions. QMS Advisors helps clients define and deploy efficient LDI solutions to achieve the highest possible relative risk/relative return ratio under constraints. 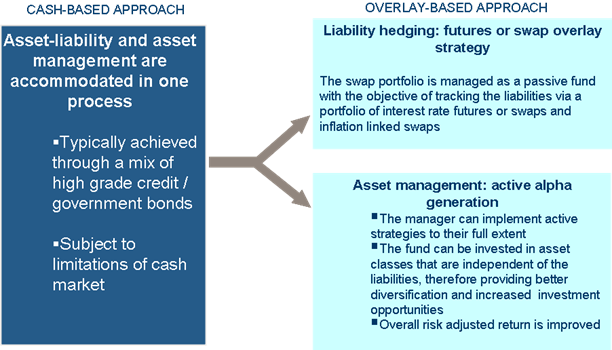 Our solutions usually involve hedging both the plan’s duration and convexity risks, while simultaneously reallocating part of the assets to higher yielding asset classes. QMS Advisors solutions may or may not involve leverage, depending on the institutional investor’s risk aversion. When leverage is used, it can be explicit, under the form of a short position in the risk-free asset, or implicit, under the form of leverage implied by the use of derivatives (typically interest rates and/or inflation swaps) in the liability-matching portfolio. Leverage allows for more potential for performance generation, especially when introducing orthogonal or absolute return investment strategies (i.e. market neutral hedge funds, capital guaranteed products…).